PHOTO BY JILL GOSCHE A Tiffin Fire Rescue Division fire truck assisted at Fostoria Junior/Senior High School early Tuesday morning. 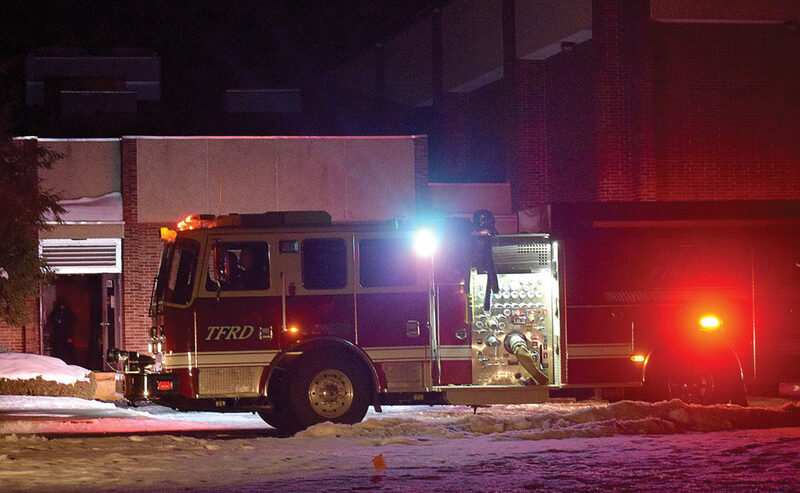 FOSTORIA — Fostoria Junior/Senior High School was closed Tuesday and is to remain closed the rest of the week due to a fire in the boiler room early Tuesday morning. At 4:45 a.m., a woman reported to Fostoria Police Department that she had looked out her window and noticed all of the lights at the school were out. About 15 minutes later, a crew noticed a smell of an electrical fire, and officers noticed a door on the east side of the building and a room were full of smoke and requested the fire department to respond, a Fostoria Police Department report states. Fostoria Fire Division, Tiffin Fire Rescue Division, Bascom EMS and American Electric Power crews responded to the school at 1001 Park Ave.
Brian Herbert, interim chief of Fostoria Fire Division, said he believed the fire started on a shelf with chemical supplies. Firefighters could not rule out an electrical issue, he said. “We don’t know (the) exact cause,” he said. Herbert estimated the fire was extinguished in 10 minutes, and it was contained to the boiler room. “A lot of water couldn’t be used,” he said. There was minimal damage in the building, but it was full of smoke, Herbert said. All district buildings were closed Tuesday. The district’s internet and phone services are housed at Fostoria Junior/Senior High School. According to the district, power had been restored to the building and servers and phones were working at the elementary buildings Tuesday evening. The junior/senior high school building is closed for the rest of the week and is to be cleaned by Cleaner & Dryer Co., Toledo. Elementary school students are to be in session normal hours, according to the district.